What is Pivot – from Microsoft Live Labs? Pivot a research product currently available from GetPivot.com from Microsoft Live Labs. It uses technology from Seadragon – Deep Zoom technology also of MS Live Labs. Which translates into the ability to aggregate and interpolate large data sets. If I’m losing you, this is a must see 5 minute TED 2010 video presented by Gary Flake. That last point struck a chord with me, and I will attempt to create a simple collection. 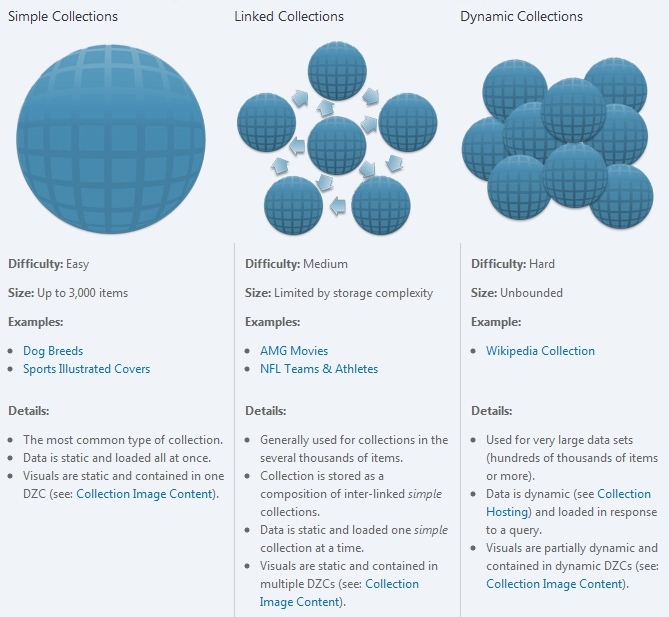 A collection in this case is a set of items with common attributes, ranging from hundreds to thousands to millions of items. Select your content; determine your linking level (diagram above). Expose your data in a way you can build the collection. OData service is an option. Build the cXML (Collection XML file). Navigate to the CXML file. Gary Flake and team Pivot walk through on YouTube. John Bristowe’s video on Pivot operations on the StackOverflow data.